CXXVI clothing has to me, created a contemporary light version of visual american nationalism but don’t get me wrong, more the identity than in the martial understanding of it. Baseball, fishes and inks reminding you of a whole part of america. 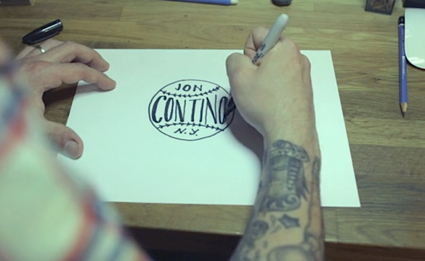 In this short film, Jon Contino, clothing designer and co-founder of CXXVI, and creative for brands such as Coca Cola, Nike Absolut etc. nervously shares with mainly his urge to create. And that is where I find it interesting, the actual daily personnality of Jon, his nervousity or this urge he talks does not appear in his work, which reflects a calmer world. Have a look!